Built to complement the small cottage hospital in Salen, its main purpose was to act as Mull’s only fixed-wing air ambulance evacuation facility. 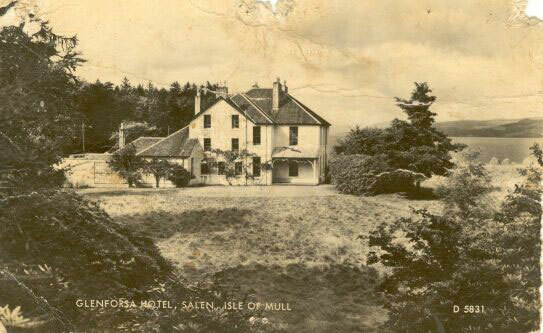 Since its inception, David Howitt and his family, who then owned the adjacent Glenforsa Hotel, have operated it first of all for the Argyll County Council, then the Strathclyde Regional Council, and at present, the Roads Department of Argyll & Bute Council. Since it was built, an average of one patient a month has been airlifted from the strip, mainly by Britten-Norman Two Islander aircraft operated by Loganair pilots, and daytime Scottish Air Ambulance helicopters. Night-time evacuations by Navy Sea Kings have occasionally taken place, and in all, over 400 patients have been airlifted from Mull. 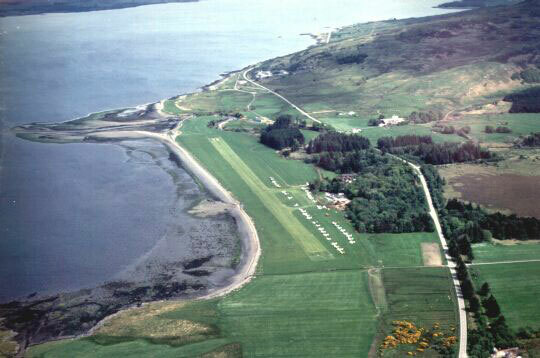 For twelve years the airfield was licensed by the Civil Aviation Authority when Loganair operated a daily summer service from Glasgow to Connel (Oban), Coll, and Mull. The improved ferry sailings from Oban to Mull – six daily – probably contributed to the termination of the air service in 1980. Many people, however, still remember that half-hour trip to Glasgow over the most beautiful countryside in the world, in the ultra-safe hands of Captains Duncan Macintosh, Jim Lee, Geoff Rosenbloom, Ken Foster, and Ben Thomas. Aztecs gave way to Islanders, then Skyvans and Trislanders, with the occasional Twin Otter, but the old BN2 outlasted them all for sheer rugged efficiency and safety in all kinds of weather. With an average of some four hundred visiting light aircraft yearly, the highlight is the annual Mull Air Rally – its 36th in 2002. Sometimes as many as 150 aircraft arrive over that Bank Holiday weekend at the end of May when Glenforsa operates a ground-to-air advisory radio on the ubiquitous microlight frequency of 129.825. 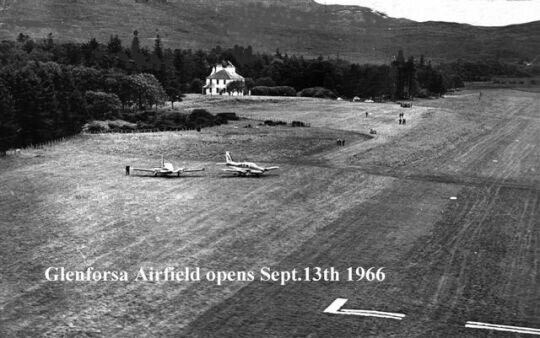 As for name-dropping, some of the famous (and discriminating) air visitors to Mull have included Ted Dexter, Russell Harty, Robert Wagner, David Coulthard, Winnie Ewing, Donald Sutherland, Dave Gilmore, Phil Collins, and Tom Cruise, to name but a few. A celebrity incident which David doesn’t mention above is the time when Sir Hugh Fraser of Harrods fame turned up with several men in a helicopter. They all jumped out and the aircraft went off somewhere else. Old ‘Fa’ Howitt demanded a landing fee, but they refused to pay on the grounds that the aircraft hadn’t actually touched down. Finally, the dispute was settled when Sir Hugh bought doubles for everyone in the bar. 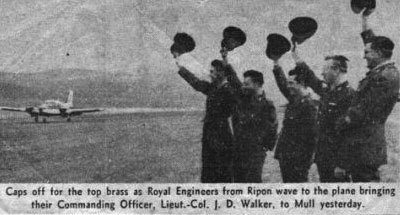 Here, a cutting from the Northern Echo (14 Sept. 1966) commemorates the landing of G-ASER as it brings the CO of the Royal Engineers unit to inspect their handiwork. David Howitt had the honour of being on board. At about that time, the photograph on the right was taken showing the strip from the east. The old Glenforsa Hotel (of which more later) is visible in the background. Here, the camera aircraft is approaching the field from the west. Nestling in the trees, the Glenforsa Hotel is within taxiing distance of the runway – how many small airfields can offer such a facility? In the distance, we see the Forsa river delta, and beyond it, the Scottish mainland. A slight hazard is a 500-foot hill at the camera aircraft’s 4 o’clock, a couple of miles from the 06 threshold. When taking off to the west, pilots must make a climbing turn to avoid this, and a similar turn on final when landing to the east. David says that he had just been for a flight with an Irishman, which might account for his state! Possibly he needed treatment with the national beverage to calm his nerves after the experience. In his brief history of the airfield at the top of this page, David Howitt makes no mention of the strange event that took place on Christmas Eve, 1975, which has become known as The Great Mull Air Mystery. Why, on that evening, after dinner with his girl-friend and a bottle of wine, did hotel guest Peter Gibbs decide to take off and do a night circuit? Why did his aircraft vanish, and his corpse turn up several months later 400 feet up the hill within a couple of miles of the hotel? Local writer Scott MacAdam has published a short book giving the facts about this extraordinary happening. The event also inspired a surreal novel, These Demented Lands, by Oban author Alan Warner, in which Glenforsa Hotel appears transparently disguised as the Drome Hotel. 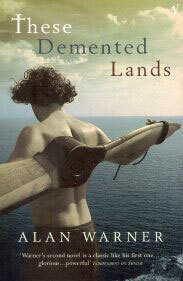 Click here to read an excerpt from the book. Alan Warner has embroidered the Peter Gibbs tragedy to the extent of having two aircraft doing night circuits in opposite directions and colliding. For years after the tragedy, wild rumours abounded as to Peter Gibb’s motive in performing this apparently insane act. It was speculated that he was an agent of MI5, doing cloak-and-dagger work in Northern Ireland. He succeeded in flying over there, but his cover was broken and the terrorists (or whoever) murdered him, brought the body back, and dumped it on the hill as a grim warning to his superiors. The body was not discovered ’till the following April. According to the pathologists’ report, as quoted in Scott MacAdam’s book, its condition was ‘ … entirely consistent with lying out there for a period of four months’. But, in my personal experience as a farmer, any corpses lying around, whether cattle, sheep, or deer, are soon attacked by scavengers and reduced to piles of bones. A shepherd (Robert Duncan) told me that he had been past that place several times with his dogs in the intervening period and found nothing. Also, there had been a huge land/air search of the area in the days following the disappearance, which also drew a blank. One wonders how much experience the pathologists had of bodies exposed for such periods. Supposing they had reported that its condition was not consistent with this period of exposure, what would the repercussions have been? Best to give the expected answer and allow the whole tragic affair to be quietly forgotten. Also, forensic tests detected no salt or marine organisms in the body’s clothing and boots. If he had crashed into the sea and swum ashore, some traces would remain in spite of heavy winter rainfall. But, then, if he had crashed into the sea and was uninjured to the extent of being able to swim ashore, why would he cross the main road and stumble 400 feet up the hill to die of exposure, when all he had to do was to follow the road back to the hotel? The conspiracy theorists suffered a blow when a diver discovered the aircraft wreckage in the sea, a short distance east of the airfield. It is conceivable that the IRA (or whoever) might bring the corpse back, drag it up the hill and dump it, but would they go to the trouble of bringing the aircraft back from Ireland to plant it in the sea? This does sound somewhat beyond the bounds of reason, even of Irish reason. Another theory is that Gibbs became lost – ahem, temporarily uncertain as to his position – and jumped from the aircraft over what he thought might be a soft place. Apart from the difficulty of exiting the aircraft while maintaining some control, the accepted wisdom is that one is better off staying with it and making an emergency landing. He would not have had a parachute. Speculation aside, the fact remains that Peter Gibbs performed an act of extreme foolhardiness. His motives will remain forever unknown to us.